I think of nervous conditions and getting out in the woods. The smell of cold air and the scent of something wild and furry running over fresh powder. There’s a need to get outside in all of us, and if we take the adventure seriously, we either run with the dogs or become one of the dogs on the couch. It’s our choice. 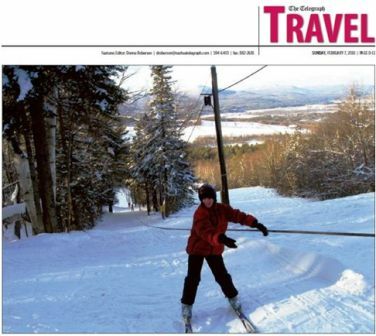 Cross Country Skiing in Jackson and Franconia, New Hampshire – Being in the right place at the right time on mountain getaways. Sometimes, it isn’t shop ’til you drop, it’s ski ’til you drop. Especially if you’re traveling with friends who’d rather cross-country in Jackson and Franconia and downhill at Sugarloaf. Sure, there’s retail therapy, but what’s better is fresh tracks down a slope, hot chocolate in a Thermos and winter wonderland in every direction. Throw in some hot tubs, a little fine dining, and a room with a view, and you have a good weekend away with the women. Martha and I get to Jackson just when Jackson Ski Touring goes half-price. Perhaps shopping at Ragged Mountain Outlet prior to skiing was a sign of bargains. We scored big in fleece: gloves, hats, scarves, even blankets. All half off. She hands us a trail map with more than 154 kilometers of trails, most of it skiable that day thanks to 10 inches of new snow. 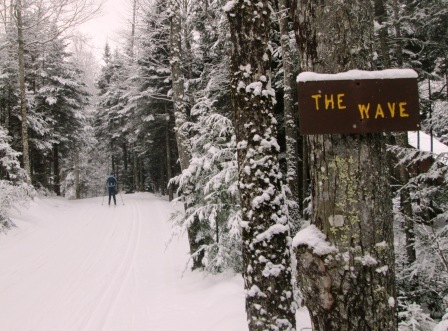 Snowshoe trails criss-cross the trails and backcountry skiing abounds for experts in White Mountain National Forest nearby. Conservation lands, with Tin Mountain Center as a focal point, border much of Jackson, as well. “Why don’t we take Yodel up to Eagle Mountain Fields?” I suggest, and Martha agrees. We head up the winding trail and careen down a pine-filled path to the open vista highlighting Spruce, Wildcat and Black mountains surrounding Jackson. We have the trails to ourselves. The racers we saw in the parking lot have packed up and gone down to the pubs for late lunch, and here we are, leisurely enjoying the groomed trails at our own pace. Even the roller-coaster zip of the Wave trail is peaceful, so we decide to brave both John and Henry hills without fear of crashing into pine trees or random racers. For three hours, and then for one last run at dusk, it’s our private resort. We drive over Crawford Pass. Mount Washington is lit up by a full moon. Cars are stopped along the highway, so Martha and I pull over, too. We stand and stare up at the iced mound of snow. It’s brilliant, like a white, glazed castle. Perfect, and free of charge. Because our families are skiing at Cannon Mountain the next day, Martha and I decide to spend the night at Sunset Hill House. Offering discounted rates on sites such as Travelzoo and Groupon, we stay one night for the package deal. The drive up to the Sugar Hill area is mysteriously eerie. No cars, no streetlights, only a full moon casting shadows on the Gothic white clapboard churches perched on ledges, the maple sugaring cabins long past being open. It seems we go up and up and up until we find the Sunset Hill House. Soon, we are rewarded by a welcoming fireplace in the lobby and a pub with warm drinks and comfort food. Martha and I walk in wearing ski pants and snow boots and the bartender smiles. “Take a load off,” she says. The next day, after a full-course breakfast of croissants and homemade oatmeal with granola, we head to the backside of Cannon and cross-country ski the high-altitude trails of Franconia Touring. There’s a bit more ice on this side of the White Mountains, but Martha and I are ready for adventure. We ski Fiji Trail and find ourselves zigzagging over frozen brooks and around cliff ledges. “This is an adventure,” Martha says with a laugh. 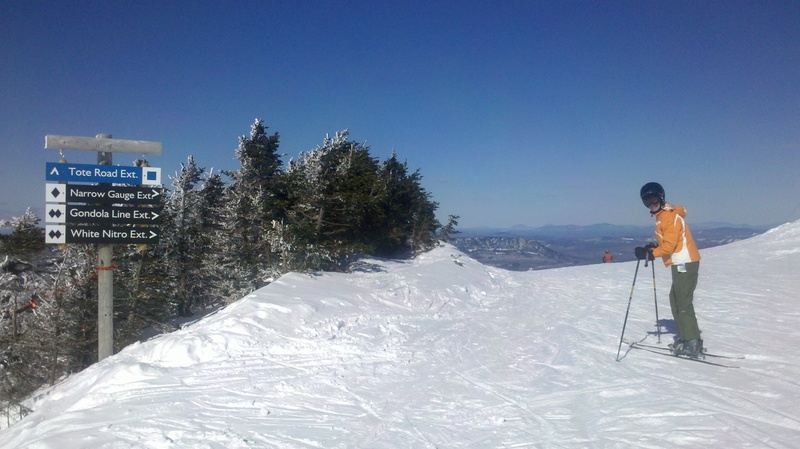 We feel like mountain women in the back country as wind howls over Cannon Mountain. The trails of an abandoned ski resort – Mittersill – beckon us higher and higher. Then, a downhill skier leaps from an icy ledge above us and we watch him pop down the trail we’ve recently skied up. “Time to shop,” Martha replies. So, we head to Franconia and reward ourselves with half-off deals at Garnet Hill outlet. I stand on the base of Mount Prospect, a ski hill with one rope tow going up to the tip of a powder-filled ridge. The rope slithers at my booted feet. “I don’t have Oilman’s,” I tell him. “Let the rope slide over first, then grab on,” he tells me. I pick up the rope. “Is there an easier way up?” a kid asks as she waits behind me. Located at the base of Weeks State Park in Lancaster, Mount Prospect rises to a 2,059-foot summit. From the stone observation tower, the views are spectacular. You can see the Presidentials to the southeast, Franconia to the south, the Kilkenny Range to the northeast, the Green Mountains and Percy Peaks. “Our tow is operated by volunteers,” the lift operator tells me. They are known informally as the Mount Prospect Ski Club. Members help out by volunteering to “work the rope” down mountain or up, donate wood for the wood stove or gas for the Chevy engine. The front trails, named Liftline, Weeks Way, South Slope and North Slope, can easily hold your attention, especially because the Packmaster has left a lot of wild in the powder. There’s no ridged flatness, no tamed tracks, to become bored with here. Suicide is the backwoods run. Jutting over a cliff and through pine glades, this trail is for the purist. Pockmarked with stump and filled with fresh powder, the trail give you a sense of lumberjack delight. There’s no ski map, no trail guide, no one telling you no, it’s just a split-second decision and a mogul run down. 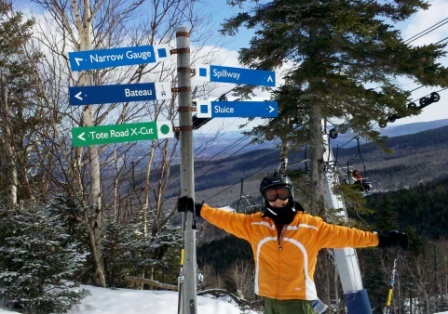 The first time I skied Sugarloaf, I was in high school, and I came down in a medic sled. I had taken a wrong turn off Tote Road and was on an expert, double-black-diamond trail. If I stayed upright on two skis, I would basically slide face first down the mountain. So, I sat and waited and when the ski patrol came, they strapped into the sled and took me down to the bottom. When they unstrapped me, I walked unassisted to the Bag Pub and stayed there for the rest of the afternoon. Thirty years later, I decided to conquer that mountain on two skis, and without help. I pick the Sugarloaf Mountain Hotel for a long weekend because it’s at the base of the mountain – the exact location of my medic sled release. I figure if I don’t succeed again, I can slide directly into the hot tub and call it a day. With teenage daughter in tow, I might be motivated to leave the warm confines of a full-service resort. The next morning, my daughter takes me to the top of Sugarloaf. “Let’s try Tote Road first,” I suggest. “Don’t be a loser, Mom,” Haley says. I contemplate continuing my loser history at Sugarloaf by longingly looking down at the Bag Pub – a tiny speck at the bottom of the mountain. The wind howls and the trail map blows away. Stunted pines, frozen with encrusted snow, surround us on all sides. “How about Blade Glade?” Haley asks. “That sounds safe,” I say. I vote for Boom Scooter in honor of my challenge. It wasn’t pretty. It was snowplow and screaming, wide wedge and jerky turn. I wasn’t necessarily upright for most of it. But I made it down Boom Scooter with my teenage daughter cheering me on. I take her into the Bag Pub for a well-deserved burger and an extra-large fry. “Did you know that Cannon has a vertical drop of 2,148 feet,” my daughter says. She then discussed Cannon history and talks about the mountain being a 4,000-footer and there will be nine lifts to enjoy in the morning. “We’ll hit the Zoomer trail first thing in the morning, then off to the Tram and finish with a hike up to the top of the mountain to ski down Mittersill.” I take a sip on my wine and look forward to a Jacuzzi tonight, for I know that tomorrow will be a full day on the mountain. But I know that a full day at Cannon is worth it. 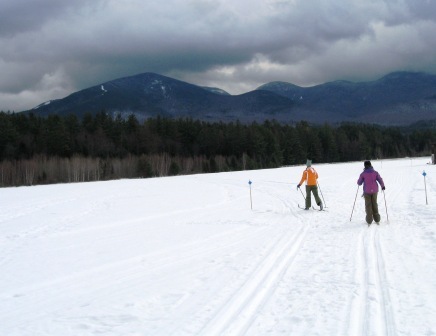 There are more than 60 miles of trails surrounding the resort, and Nordic skiing is Mount Washington’s best kept secret. Off you can go into the trees and across fields, and when you return, there’s a massive fireplace to sit next to. And time for a relaxed dinner in the intimately wonderful dining room in our Nordic boots. Outside, the dog sleds raced across moonlit meadows, their howls distant as the night passed slowly.